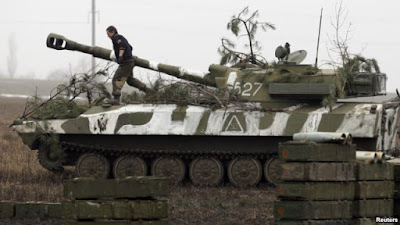 WASHINGTON, DC -- A senior official said the U.S. is “deeply concerned” about an escalation in the conflict between government forces and pro-Russia separatist rebels in recent weeks in eastern Ukraine, despite a series of cease-fire attempts. A member of the self-proclaimed Donetsk People's Republic forces walks atop a self-propelled artillery gun during tactical training exercises in Ukraine's Donetsk region. Reports from the Organization for Security and Cooperation in Europe (OSCE) have indicated that a majority of cease-fire violations come from separatists-controlled areas. 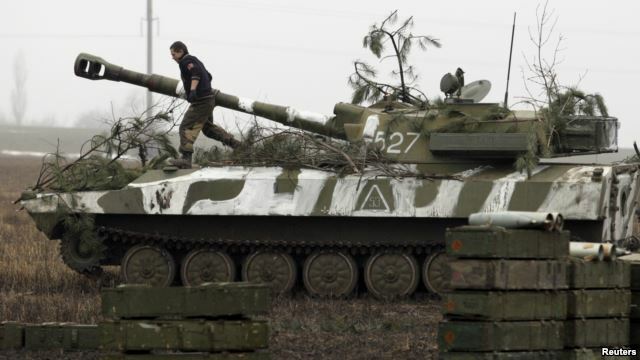 A senior State Department official told VOA on Tuesday that the fighting is an indication that insurgents are not keeping up with their commitments under the Minsk agreements. The so-called Minsk II agreement, mediated by Germany and France, represents a package of measures to alleviate the ongoing conflict in eastern Ukraine. It was agreed to by Ukraine, Russia, and separatists in February of 2015. It also authorizes OSCE access for monitoring and verification of the cease-fire and heavy weapons withdrawal. However, the ongoing fighting has thrown into doubt plans under the Minsk agreement for local elections in separatist-held areas. Meanwhile, Secretary of State John Kerry told lawmakers on Wednesday that the U.S. is increasing funding to support Ukrainian stability while pushing hard for its political reforms. Various reports have blamed separatists for stepping up attacks on government forces to levels not seen for months. On Wednesday, while testifying before a congressional panel, Kerry said the U.S. is also increasing funding to counter what the West sees as Russian aggression. "Russia has a clear choice between continued sanctions and meeting its obligations to a sovereign and democratic Ukraine," Kerry pointed out in his written testimony to the House Appropriations Committee. The administration has requested $3.4 billion for the European Reassurance Initiative (ERI) to support efforts to ensure peace and security in Europe. That total is four times the amount requested last year. Beginning in February 2014, Russia orchestrated a military intervention and ultimately annexed Ukraine’s Crimea a few weeks later, a move that was largely condemned by the international community and brought sanctions from the United States and European Union. In eastern Ukraine, despite international efforts for a cease-fire and de-escalation of the crisis, fighting between government forces and separatists widely seen as backed and armed by Russia has continued. Senior U.S. officials have made it clear that for the U.S. to roll back sanctions, there must be a complete implementation of the Minsk agreements. That would include a full cease-fire, the withdrawal of all foreign troops and equipment from Ukraine, the full restoration of Ukrainian control of the international border, and the release of all hostages.